Throughout fashion month, our editors had their sights focused on the S/S 19 runways everywhere from New York and London to Milan and Paris. After sifting through hundreds of shows, there were plenty of new and exciting trends we spotted to look forward to for spring 2019. Thanks to superb collections from the designers at Paco Rabanne and Chloé, we’re seeing collections centered around escapism—pieces that will no doubt be packed in the suitcases of women off to explore new corners of the globe. On the other hands, Chanel and Prada solidified bike shorts as one of the latest streetwear trends to be adopted on the runways. And while proportions have been growing over the last few seasons, the volume has been turned up to high with frothy gowns and exaggerated ruffles at Rodarte and Marc Jacobs. Ahead, we’re taking a look at eight of the biggest trends that everyone will be wearing come spring 2019. If you’re inclined to get an early start on these, though, we’ve also included pieces to shop so you can start wearing them now. Did designers have half-packed suitcases in their ateliers this season? All signs point to yes. Ideas about exploration were woven into collections across the board. 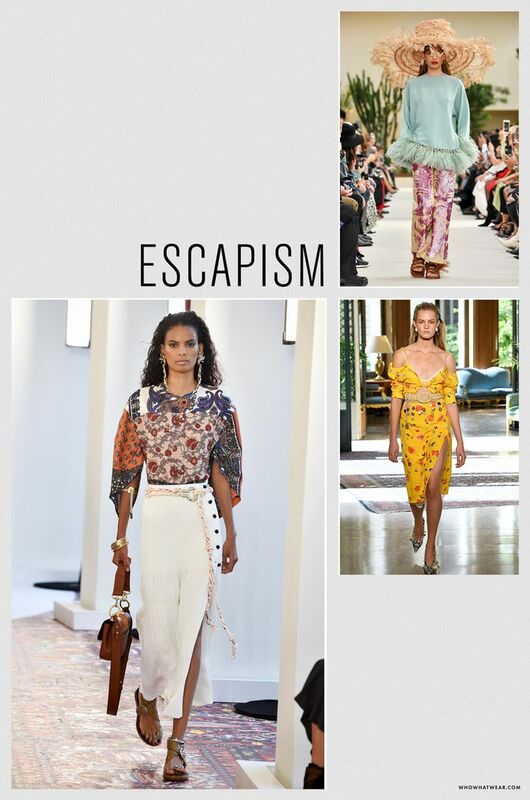 Whether sunny tropical prints topped with seashells or prints sourced from travels across the globe, there is an inclusive look at style outside of the fashion capitals. Meet the new silhouette for spring: extra-long jackets with a midriff-baring front. Seen in collections including Alexander McQueen, Altuzarra, Paco Rabanne, and Chloé, these jackets are one of the freshest new shapes for this season. Over the last few seasons, we’ve seen proportions get more and more exaggerated, but for spring the volume was turned on high. Larger than life ruffles hit the Marc Jacobs runway, while Gucci turned out puffy voluminous sleeves, and Rodarte debuted a collection brimming with frothy gowns. Art was top of mind for designers this season. At Louis Vuitton, graphic ’90s Memphis patterns in electric shades of turquoise and yellow were emblazoned on dresses and coats. While at Marni, literal images of Italian sculpture were developed into custom prints. While we have seen bike shorts emerge on the street style scene throughout this year, the piece was solidified on the runways. Whether paired with tweed jackets at Chanel, crisp button-downs and waist belts at Fendi, or padded headbands with knee-highs at Prada, there’s no doubting the versatility and persistence of the streetwear trend. While there were plenty of vibrant shades on the runways, one of the major color statements came in the form of nudes. Throughout the season, designers dressed models in head-to-toe looks built around muted, earth tones. This trend is all about layering different shades and textures to add dimension to a neutral palette. Many touchpoints of spring mark a return to handcraft—like the many crocheted pieces spotted in collections like Carolina Herrera, JW.Anderson, and Maryam Nassir Zadeh. Feathers have been on the minds of designers for a few seasons now, but this time around, the drama has been turned up. Instead of small embellishments to trim pants or shoes, they’ve become the main focus. Next: Read about the biggest sneaker trends for spring 2019.